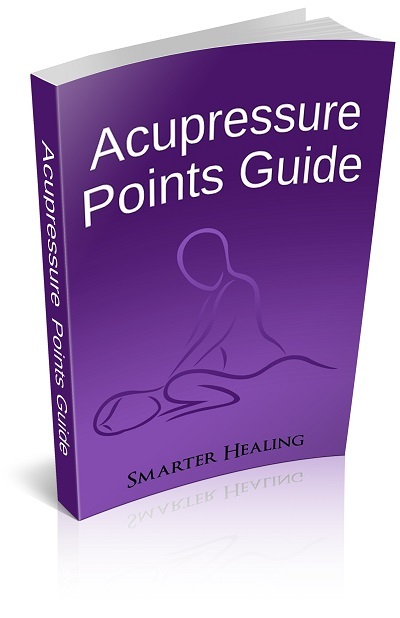 Can acupressure relieve constipation and digestive problems? Thankfully for everyone involved in alternative medicine, energy healing techniques like acupressure can often get rid of annoyances like gas and constipation where traditional over the counter medicine fails. That's because acupressure is a healing technique that empowers the body to heal itself, rather than relying on drugs or other outside influences. Acupressure allows us to balance the meridian energy of the body and thus send healing energy throughout our organs, including the digestive system. This can lead to powerful relief for annoying symptoms of digestive problems like gas, constipation, or diarrhea. Acupressure and similar energy healing techniques often work where nothing else will. This is because energy healing methods approach the problem at the energetic and/or spiritual source of the problem, which lies deeper than just the physical problems themselves. Of course, I have to mention that acupressure won't always be a magic bullet. If you have a horrible diet that is causing you digestive problems, then perhaps it'd be more efficacious to get rid of your gas and bloating issues by fixing your diet. Acupressure can help your body heal itself, but it can't magically change your diet to include more fiber, which is an important aspect of many digestive health problems. Regardless of the direct physical cause of your gas problems, you can help your body operate at maximum performance and rid itself of these gas problems as much as possible by balancing the flow of your meridian energy. And you can do that with the right acupressure points in just a few minutes. Let's take a look at some acupressure points specifically chosen for digestive relief, which can help get rid of gas, bloating, constipation, and other intestinal issues. 1. Conception Vessel 12, in the middle of the abdomen, about halfway between the belly button and the bottom of the breastbone. Warning: Do not use this point for prolonged amounts of time. It's also best to avoid putting pressure on it with a full stomach. This powerful Conception Vessel acupressure point will relieve all manner of digestive problems. It will relieve stomach pain, abdominal muscle spasms, and heartburn. It will help get rid of digestive problems that cause gas, and relieve constipation. It will also help relieve emotional stress such as anxiety that may be contributing to an upset stomach or poor digestion. 2. Conception Vessel 6, in the middle of the abdomen, exactly two finger widths below the belly button. Use this pressure point on your abdomen to relieve abdominal problems such as pain, constipation, and gas. This point will help heal digestive problems of all types, and will even help reduce back pain. 3. 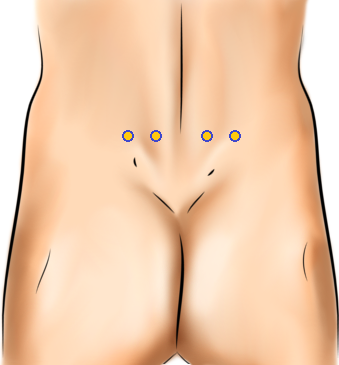 Bladder 23 and Bladder 47, located on the back, at waist level, two finger widths and four finger widths (respectively) to the side of the spine. Use these adjacent Bladder meridian points to relieve indigestion and other digestive problems. These points can help relieve stomachaches, abdominal pain, and other problems which may be associated with excess gas. 4. Stomach 36, located on the front of the lower leg, about four finger widths below the kneecap and one finger width towards the outside of the shinbone (away from the other leg). This Stomach meridian point will help problems with your stomach and digestive system. It will relieve stomachaches and poor digestion, helping to relieve your gas as well. This point can be used for all sorts of stomach-related health problems. It will also help improve your metabolism and thus relieve fatigue that is related to your digestive system. 5. Pericardium 6, located in the middle of the inner side of the forearm, about two and a half finger widths below the crease of the wrist. Use this easy to access pressure point on your forearm to relieve indigestion, stomachaches, and nausea. This point can help settle your stomach, which can contribute to relieving gas as well. This point is also used to relieve anxiety. 6. Spleen 4, found on the arch of the foot, on the side with the big toe, about one thumb width away from the ball of the foot towards the heel. 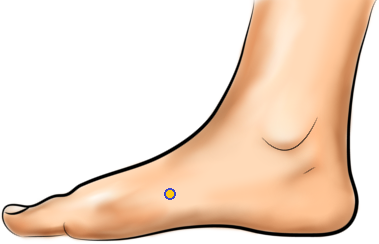 Use this pressure point on your foot to balance the Spleen meridian, which will aid your digestion in various manners, helping relieve indigestion and gas. This point will also help stop diarrhea, and sooth the muscles of the intestines and stomach to get rid of abdominal cramps. It will relieve stomachaches and also help reduce anxiety.